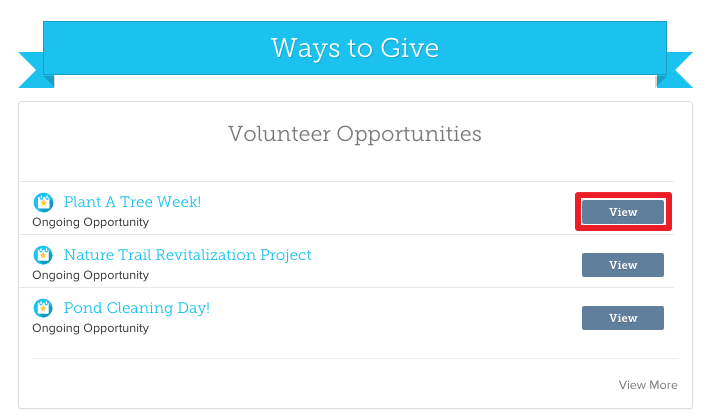 Navigate to a list of volunteer opportunities by clicking on “Discover” in the top navigation. After getting to the "Discover" page, click the "Opportunities" button to navigate to a searchable list of volunteer opportunities. Refine your search by location radius and the type of opportunity you’re looking for on the left side bar. To learn more about an opportunity or to sign up, just click on the name of the opportunity and you’ll be taken to its opportunity page! You can also find a list of an organization’s upcoming, ongoing and past opportunities on their profile page under the "Ways to Give" section. Click the “View” button to view details about the event, as well as the specific tasks in need of volunteers. If there are many opportunities available for an organization, you can click the “view more” link to see them all.